Last weekend I took #1 son to the Royal Ontario Museum in an effort to occupy a busy guy on a cold and wet weekend day. We stumbled upon a great exhibit aptly entitled “Water”. It was an interesting diversion. According to one of the displays, Canada has the third largest fresh water supply in the world, coupled with a much smaller population. On average we consume 87 gallons of water a day, but here is a strange but true fact, there is actually 29 million gallons of water available to each and every person in Canada. Based on that statistic, I think we are going to survive just fine. So why am I mentioning this? Well its’ not so much the water we use that concerns me, its’ the water that dump back into the system. First of all, let me say that I am not a militant environmentalist. I actually don’t consider myself all that “green”. I drive a Yukon but at least its’ a hybrid so lets’ just say I’m green with a small “g”. I’m actually way more pragmatic and tend to focus on what all this water use will mean in the near future. As anyone who has sailed in the Toronto Harbour can attest to, in the few hours after a big rain storm, the harbour is absolutely littered with waste from the streets including what we sailors refer to as Balloon Fish (you would call them used condoms). The reality is that when we have a big storm, the city cannot deal with the additional waste so it bypasses the treatment plants and goes straight into the lake. One word….Gross. Now imagine if you will, what will happen in 20 years when Toronto has 1 million more condo units in the downtown core. That means, at the very minimum 2 million more people adding to the treatment plants on a daily basis. All of a sudden, the idea of limiting water use, or more specifically waste water, seems quite important. So we are faced with some choices. First we can invest heavily in upgrading our sewer systems (read- digging up the existing decades old sewer pipes on your street), build better and more efficient sewage treatment plants, or attack it from the source, which is to limit how we use our water. Already households are being retrofitted with wireless water meter reading devices, but this is simply a way to pay for the water we use. It doesn’t really address how we use it. While probably a next to impossible task, perhaps it would be better to monitor and meter the waste we push out rather than the water we consume. I think a better system, one that can be initiated now, would be to install mini water treatment plants in residential and commercial buildings. These plants would capture grey water, scrub it and then recycle it for use in toilets, and irrigation. The use of grey water is not a new idea. It is currently used in many areas around the Globe, from private homes to areas with water supply shortages. 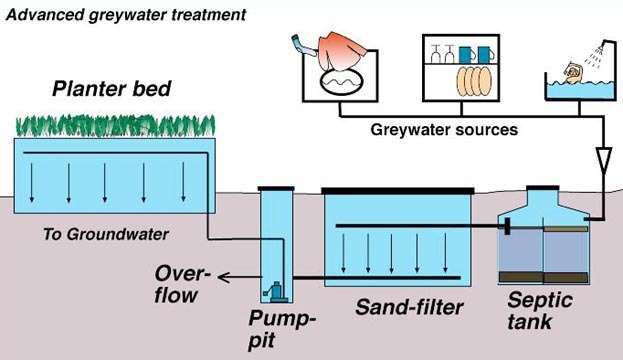 Here is a diagram of how a basic grey water system works except that instead of directing water into a planter bed, it is used to flush toilets. Perhaps we will need to keep the lid down so Fido doesn’t drink from the bowl. Its’ time we thought about it. Special thanks to Carl Lindstrom of Greywater.com for the diagram. ← Do You “Own” your listing? It is amazing that a species that is 2/3 water would treat this resource with such little active thought. The future development imperative will include conservation, and increasing public awareness of our shared opportunity to create change. We should do a tour for Bosley agents of infill projects that demonstrate the commonsensibility of cisterns, water conservation, and progressive development considerations. I have a listing upcoming that has a 4000 gallon cistern integrated into the automated irrigation system.